Sarah Jane Honeywell is an English actress, dancer, and a tv personality and is a mother of two sons. She is currently married to husband Ayden Callaghan. The couple welcomed their second son on 24 January 2018 and his name is Indiana. Ayden Callaghan and his wife Honeywell got married in 2016, shortly after they had their first child in 2015. Honeywell, who is 43 years old, announced the news about her pregnancy with her husband Ayden in September. The couple also posted a video on YouTube revealing the news about her pregnancy to the world. This was her third pregnancy as she suffered a miscarriage during her first pregnancy. Anyway, Honeywell and her husband are blessed for the second time as they have already welcomed their second baby into their life. The former CBeebies presenter, Honeywell and her husband Ayden were expecting a child for the second time since September. And 5 monts after they revealed about the pregnancy, they welcomed the child. The 43 years old mother revealed the big news by posting a picture of the newborn baby's feet with an identity tag on Twitter. Honeywell's husband Ayden also posted a picture of their baby boy's feet on Instagram and also revealed the name of their second son. They named him Indiana Fox. Ayden was not present during the delivery of his wife as he was stuck in London due to the canceled trains and reached later that night as he mentioned on his Instagram. He also mentioned the staffs of Lincoln Maternity in his post and thanked them all. "Thank you so much to Dr Flood who came in especially to take care of a tricky and early procedure because the little guy didn’t want to wait any longer". 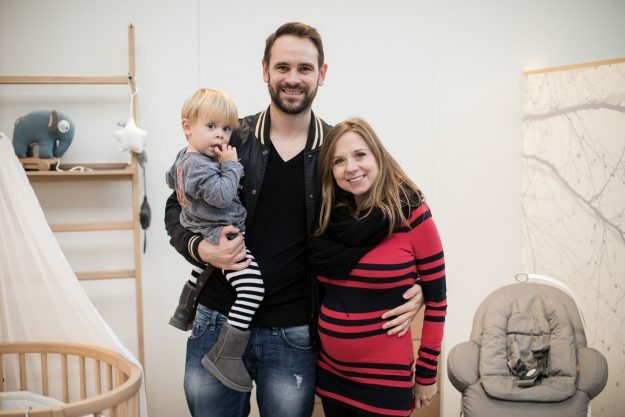 Honeywell's first son Phoenix is now 2 years old, and we are pretty sure that he will love to see his baby brother. Ayden Callaghan and his wife Sarah got engaged on May 2015. Later that year in August 2015, the couple had a baby. They announced their pregnancy on their engagement. Their elder son Pheonix is 2 years old. Although this was Ayden and his wife's first child, this was her second pregnancy. During her first pregnancy, she suffered a miscarriage which she honestly mentioned during her second pregnancy. But there her endurance paid off and now she is a mother to two kids. Ayden and his wife Callaghan got married after they had their first child in 2016. Honeywell used to work in the CBeebies, but later she got fired from the company after she posed semi-naked for the charity, PETA. At present, she is a children blogger and posts the blogs about her life on her site Honeymumster.